Brackley Town Park, situated on the High Street is owned by the National Trust. 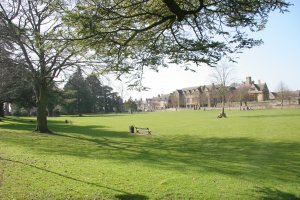 However, Brackley Town Council owns the lease and manages the park and facilities. Play equipment within the park is suitable for children aged up to 8 and public toilets are also available for users of the park. 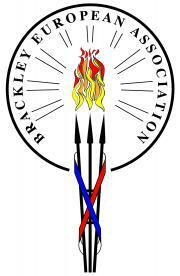 Brackley Town Park is the venue for numerous annual community events including Brackley Beer Festival in July and Classic vehicles in the Park held in August. Situated just off Martial Daire Boulevard and accessible via Tudor Way, this area is known as the American Field by locals. The open space was created when USAF built nearby houses to accommodate personnel stationed at nearby Croughton and Upper Heyford. 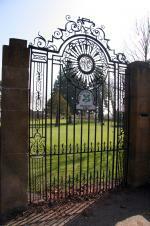 There are two areas to the park: one which is grassed with a circular walk and another area smaller area. This beautiful area of Brackley situated on the southern edge of the town is a man made water facility created by Anglian Water Authority in 1977 as a balancing lake for the new residential developments in Brackley at that time. Covering about 5 acres, the lake and park are very popular with residents of all ages. 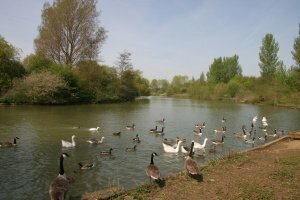 Brackley Town Council operates the area in conjunction with Brackley & District Angling Club under leasing arrangements from Anglian Water. The park is open to the public wishing to enjoy wildlife and scenery. There is a varied population of wildfowl of the lake including Moorhens, Canada Geese, Grebes, Coots and Kingfishers. Swans frequently visit the lake but have yet to settle permanently. There is a thriving population of Pipistrelle Bats, which can be seen at dusk and Grass Snakes are frequently seen swimming on the surface of the lake during the summer.